Given the critical importance of getting agency search right, the article focuses on the importance of having a well-managed process to search for, shortlist, and choose communications partners. 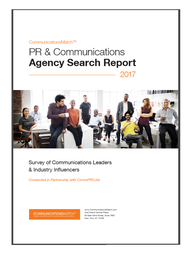 More than 76% of respondents to our 2017 Agency Search Report cited asking peers for recommendations to find agencies. However, along with my co-authors Steve Drake and Robert Udowitz, principals of RFP Associates, we argue that companies need to go beyond word-of-mouth recommendations if they are to find agencies that will be the best fit for their businesses. Why? For one, because the industry’s high agency turnover rate (in the agency search report, 37% of respondents said they were looking to hire new agencies) underscores mismatches in capabilities, needs and expectations. In addition, it’s important to look beyond who you know to find qualified diverse agencies. The article explains the importance of drafting a “measures of success” document to guide agency searches and support a thorough RFQ (Request for Qualifications) and RFP (Request for Proposals) process to select finalists for presentations. The article and our other Agency Search Resources address the importance of capabilities and chemistry in the search process, as well as asking the right questions to find the right match. We also note that search and PR RFP technology will change the search process for the better, but there continues to be a need for qualitative assessments of capabilities as outlined in our Guide to Agency Search. Prior to founding CommunicationsMatch, Locke held senior corporate communications roles at Prudential Financial, Morgan Stanley and Deutsche Bank and founded communications consultancies. CommunicationsMatch’s agency search and online RFP platform, developed with RFP Associates, simplify the search and agency hiring process. Using these or other tools, make comprehensive searches for agencies, consultants and freelancers quick and more efficient. And, requesting information from agencies and issuing an RFP becomes a simple, manageable process. For companies where bandwidth for agency search is an issue, our Agency Search Consulting services leverage our platforms to provide everything from search support to turn-key management of the entire search process. Search for communicators. Become a communications agency or individual member to create a profile.